In Yaletown - the sliver of a neighbourhood on the north side of False Creek in the downtown peninsula - it's all about seeing and being seen. Living la dolce vita, eating out, spending money, working out and being pampered. From the chic restaurants with their outdoor patio dining, to the brow and lash salons, hot yoga studios, and specialty shops featuring high-end gifts for the young urban professional who has everything, Yaletown is a magnet for couples in their 20s and 30s who aren't quite ready yet (if ever) to start a family and buy a house in the 'burbs. In the late 1980s, Yaletown was a landscape of ageing brick warehouses, light industry, and parking lots. Back then, it was possible to cheaply rent space in a dusty old warehouse that had yet to be renovated, reaching your funky studio via an industrial, hand-operated elevator. 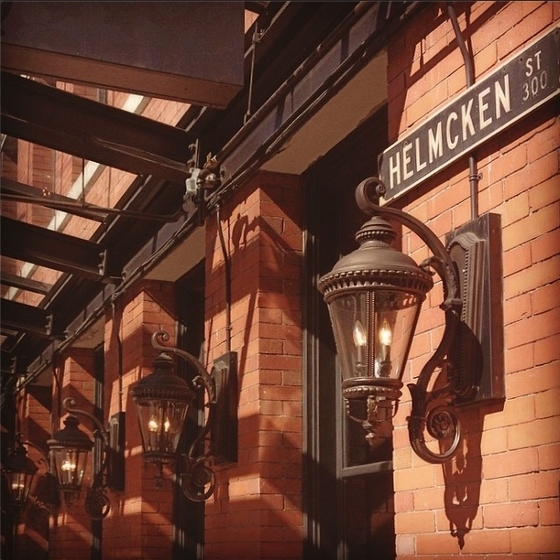 In the mid-1990s, the first "warehouse conversions" turned these buildings into chic condos. In 1886, the Canadian Pacific Railway moved its divisional headquarters, formerly located in Yale (thus, "Yaletown") to a spot near the foot of modern Drake Street. The CPR Roundhouse, built in 1888, became a community centre in 1997. In an 1893 map, the city remains undeveloped east of Homer Street and south of Smithe Street. Warehouses and factories were built in the 1910s. A 1927 map shows Hamilton and Mainland streets extending south to Drake Street. Today, the west sides of these streets still have raised loading docks (today's sidewalks) that once fronted warehouses. Industry exists in name only; Coopers' Park is named for the former Sweeney Cooperage, a barrel manufacturing company from the early 1920s to 1981. The Canada Line, with its Yaletown-Roundhouse stop, in 2009 brought rapid transit to an area already served by bus, and by "aquabus" links across False Creek. The 2011 Statistics Canada census reported Yaletown's population density as 130.6 persons per hectare. In comparison, the highrise apartments of Downtown South, immediately west, has 304 persons per hectare.